After Jean posted a fantasic deal on the Gap legging jeans this morning, I had to stop by the mall to check them out. I did find some pretty sweet deals that I'd like to share with you guys. Every single pair fits me with no waist gap. Unfortunately, the length runs a little long for me. I walked out the store with 3 pairs of jeans for $35.00. Please note all sales are final. If you need to order them online, check out Jean's post on tips how to score these jeans for $24.48 (was $69.50) with free shipping. Omg this is such an amazing deal! Thanks so much for sharing this. I love the white ones on you the most. 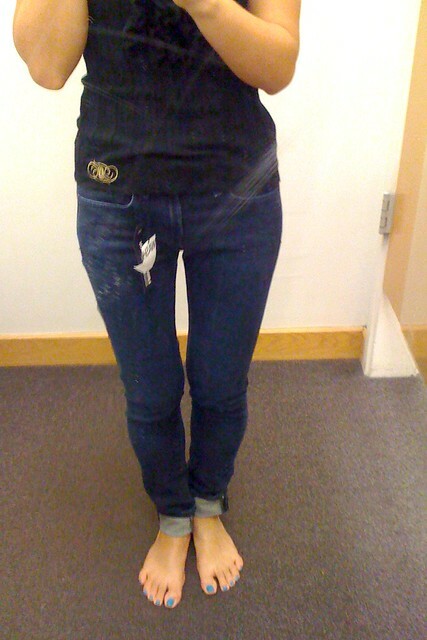 I always have trouble finding skinny jeans that are "skinny" enough on me, especially at the knees and ankles. I'll have to check this deal out! Wow! What major scores! You look great in the jeans you got!! Good job Sydney! i love the jeans you ended up purchasing. they flatter your legs so well! Sydney!!! Did they have 00r in gray like ur white ones at ur local store!!!? ?I have been wanting gray forever!!!! Please help!!! I love GAP 1969 line! Amazing deals you got. Im going to check out tomorrow. I'm petite sized too! hahaha. you found the perfect pair. enjoyed reading your blog and following! Wow, this is an amazing deal! I'm so glad some worked out for you. Sadly I have to do a 28 hr shift today and can't make it in! I saw Jean and your post about this sale. Ended up stopping by Gap on my lunch and put a pair of the white legging jeans on hold. I'm curious to see your take on styling them. I currently just have white capris and just style it with wedges and a basic top. woah those are awesome deals !! Thanks for the reviews. I noticed that you have the bottoms rolled up on the pairs you purchased. Are you planning on wearing them this way or having them hemmed. I think they look great rolled up, but I'm curious how you plan to wear them. Thanks again. Your reviews and styling tips are so helpful. white legging jeans are a must for me! glad you scored some. Amazing deals! I may have to go to the Gap this weekend as well after seeing how well you did! Remember the BR ikat skirt you posted a week ago (ish)? I returned, re-bought, and finally posted the photos. Thanks for sharing the link on how to style it - once hurricane Irene passes and the humidity drops I'll be sure to try it with a jean jacket. I included you in the post as a source of inspiration!